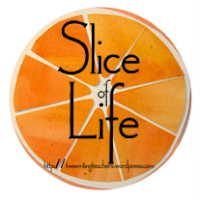 Slice of Life is hosted by Two Writing Teachers. One night last week, I spend the entire night reading. It was right after dinner, when I started a novel I had just downloaded to my Kindle. I spent hours on my couch with the novel that night. My bedtime approached so I moved upstairs to my bedroom, but I could not go to sleep until I finished the book. I. Could. Not. Put. It. Down. About one a.m., way past by bedtime, I swiped to the last page of the book. I don’t often have such a long stretch of time that I can devote to reading, but this book immersed me in someone else’s life story, providing me a temporary, but rewarding break from my own life. After reading the book, I researched the author and discovered that the book is a genre called new adult fiction. According to my online research, new adult fiction consists of novels with a protagonist in the 18-30 year old range. I’m about a decade past this age range, so new adult fiction is new to me. I probably would not have ventured into reading this genre or book if it were not for a tweet which then led me to check the reviews. The novel lived up to all that reviewers had written about it. The story line got pretty intense. It made me wonder, “What would I do?” It moved me to tears. It made me think deeply. I could not put the book down so I read it cover to cover in one sitting. I could not put it down because I was so immersed in the story and the dilemma of the main character that I just had to find out what happened. I could not put it down because my mind was reeling with emotion. I could not put it down because I was inside the story, experiencing it from deep within its core, from a place where the story, although I have never actually lived it myself, now became a part of me and who I am as a human being. Days after reading this book, I was still thinking about it. I thought about the experiences of the characters in the book and what it meant for my own life. I learned something about myself and something about others from reading this book. I have a better understanding of a situation even though I have never actually lived throught it. I now know that sometimes what appears to be weakness is really strength. I will be more empathetic. I will judge less. I am forever changed by this one book I read. I am changed by all the books I have ever read. There are lots of numbers and statistics out there about Americans and book reading. I’m sure some pretty dismal numbers would turn up if I did a google search: How many books does the average person read? How many Americans have read a book in the last year? How many college graduates have read a book since graduation? The statistics indicate that there are probably people who have not experienced the I-could-not-put-it-down moment while reading a book. Some people may not know what it is like to be inside a story. Some may not even have read a book that was life-changing. Some may not have read a book and then lived with the characters for days, weeks, months, a lifetime. There are people who can read, but just don’t. This is sad and a way of being that I find hard to imagine. I learn and change one fiction novel at a time. I have a core, rock solid belief that reading makes me a better person. Reading can make us all better people. I’m sure I’m not the only one who watches the news or reads the posts that pop up in Facebook feeds lately and thinks that the world needs more kindness, more empathy, more compassion. What the world needs is more readers. If reading can change me, it can change us, it can change the world. There have been several articles recently about how reading fiction develops empathy. You left a cliffhanger, though. What was the title of the book? That is true, I did. The book is It Ends With Us by Colleen Hoover. Not an author I was familiar with, but an insightful read. I, too, find myself not wanting to put a book down. I have to manage my time so I am able to read. I read many books - in the summer most are YA that will make their way into my classroom, hopefully inspiring my students to lead a readerly life too. I read many children's books, too, in the summer so I can book talk them to my students and get them motivated to read. Leading students to a readerly life is one of the most important things we can do. I've been thinking along similar lines lately and feeling the responsibility to inspire life-long readers. Thank you for sharing your thoughts. By the way, I, too, would love to know the title of this book! We do have a great responsibility to inspire life-long readers, but it is one of the most important things we can do for our students. The book-It Ends with Us by Colleen Hoover. I'd love to read your thoughts on it. :) Maybe we should all write a post on the link between Empathy and Reading and maybe we can get something started. What do you think? I turn to books often as a lifeline to how I live. Your post would make a wonderful op-ed in a newspaper, Lisa. I wish more people would find the joy of reading that many of us here on TWT do. Thanks for sharing such a heartfelt piece. Thanks for your kind thoughts. Reading is something that has always been a part of my life but as I get older I realize just how much I need it in my life. I, too, want everyone to experience this joy! isnt it crazy how a story can get so stuck in your mind? I love when I get all caught up in the reading zone. It's almost as you right there with the main characters and then you wonder what they are doing after you finish the book. It's crazy, but in a good way. I've been reading so many books for my young readers that I haven't even touched a real adult book lately, or should I say "new adult fiction". I've only gotten to read two books written for adults this summer because I, too, have been reading so many children's books. I hope to get at least on more adult novel in this summer, but I only have three weeks to do it. This is success! When a book stays with us and changes us. It is exactly what I want for my students. The world needs lifelong readers for sure, Lisa. This is a great lead-in thought to reading during the year for students. "I learn and change one fiction novel at a time." My greatest hope for my students is that they see how powerful reading is and that it can change them.